The model 7230 is a new concept in general-purpose DSP lock-in amplifiers. This instrument is our next generation offering based from the 7225 lock-in amplifier. 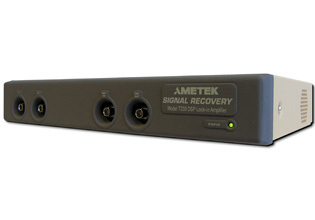 It offers the excellent signal recovery performance that users expect from our instruments at competitive price. The 7230 offers a virtual front panel via a web browser which gives it a low profile for integrating into larger system configurations. This has been achieved by easy-to-use control panels that can be operated from any computer via your favorite browser. The 7230 offers the most versatility in any experiments configuration. It is normally configured for operation over a frequency range extending from 1 mHz to 120 kHz. However, for a small extra charge it can also be delivered, or upgraded via a firmware update pack, to allow operation at frequencies of up to 250 kHz. You can use any web compatible device to operate the model 7230, ranging from a simple netbook to the most powerful development machine, from an Android smartphone to the latest iPad. No special software is needed, since the panels work directly through the device’s browser. All that is necessary is that the computer and instrument be connected to the same Ethernet network. The instrument is also much more compact than traditional designs, making it easier to accommodate in crowded laboratories, and as it does not include any cooling fans it is completely silent, which is especially useful for acoustic research. In common with other models in our range the 7230 offers much more than just dual phase lock-in detection at the reference frequency of an applied signal. It includes features unique to SIGNAL RECOVERY instruments such as dual reference and dual harmonic detection, which allow signals at two different frequencies to be measured simultaneously, and tandem demodulation. It also includes virtual reference mode, allowing reference-free measurement of suitable signals. The main ADC sampling rate and the rate at which the analog signal outputs are updated is 1 MSa/s, giving excellent performance when used at short output filter time constant settings, such as in scanned probe measurements. The maximum rate at which data can be stored to the internal curve buffer is 1 μs per point, allowing direct capture of instrument outputs when using these short time constants. The buffer length of 100,000 sets of points gives a recording time of 100 ms at the fastest sampling rate. The built-in web control pages allow full operation via the Ethernet interface, which with the USB and RS232 connections, can also be used to operate the instrument from our comprehensive software package, Acquire, from our ActiveX control and toolkit(SRInstComms), or using the free LabVIEW driver. In summary, the Model 7230 offers a very cost-effective solution to users who need a lock-in amplifier suitable for straightforward applications but with the versatility to also be used in complex experiments. Model 7230/99 Increases upper reference frequency limit from 120 kHz to 250 kHz. Can be installed by firmware upgrade.